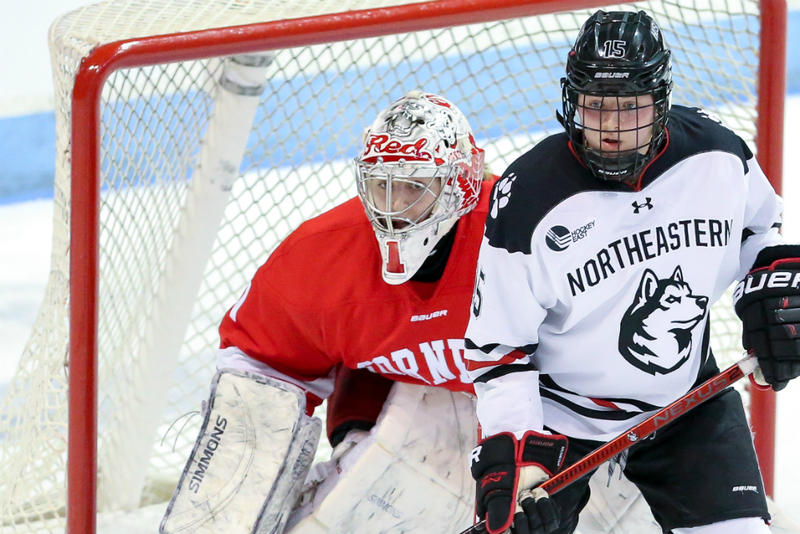 Both ECAC teams battled hard in the Frozen Four semifinals, but couldn’t come away with a win. Cornell fell in the first semifinal to Minnesota, 2-0, and Clarkson lost to Wisconsin in the second game, 5-0. Both games were closer than the shutout score lines would indicate, particularly for Cornell. Here are some quick thoughts on both teams’ performances at the Frozen Four, and over the course of the season. This was only the second time in five tries that the Golden Knights reached the Frozen Four and failed to win it all. When they won their first national title, a 5-4 win over Minnesota in 2014 (also in Hamden), it was a major shock to the women’s college hockey world. It says a lot about the growth of the program since then that now, most people expect them to make it this far and compete for a national title. 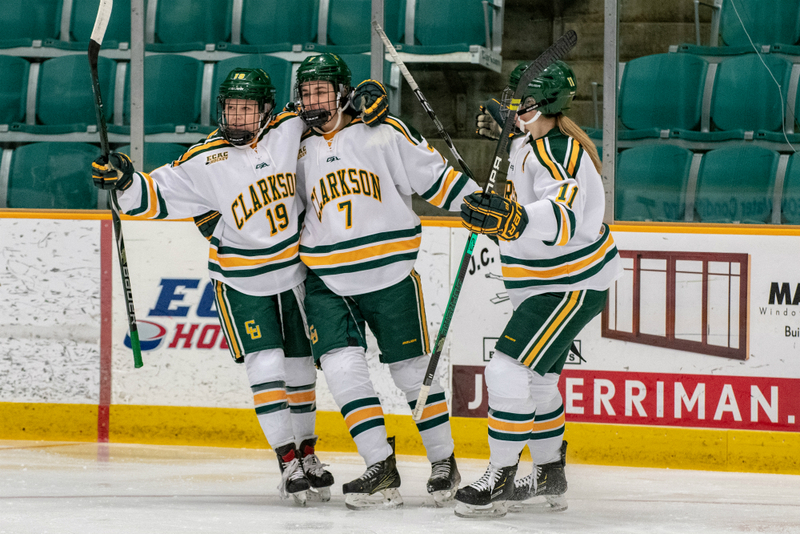 “I don’t think there’s a lot of programs out there that can say that, that the expectation is to win championships and compete for national championships each year,” head coach Matt Desrosiers said following the game. “[The players] have done a great job putting us in a very good position, now and moving forward, hopefully. The thing I love most about this group is that they don’t take it for granted. It was tough for Gabel to say much else after that. As someone who just appreciates women’s hockey, both as a media member and a fan, that top line is one of the best we’ll ever see at this level. I don’t think it’s a stretch to say a lot of people loved watching them, too. Though the final score of 5-0 doesn’t reflect it, senior goaltender Kassidy Sauvé made some key saves all game to keep the difference to just one goal into the third period so her team could stay alive. She came to the Golden Knights for her final year after spending her first three years with Ohio State. I asked her after the game what it meant to her to be able to join Clarkson, even for just one season. Cornell came into the weekend as the only low seed at the Frozen Four. In my mind, they hardly played like it. They were right there with the Gophers for the full 60 minutes; the second goal against didn’t come until the final 35 seconds of the game, when Sarah Potomak nailed an empty-netter. That was largely due to a conscious decision from head coach Dough Derraugh and his staff to let the team play their game, the same type of play that’s brought them success all year. Cornell’s top line of Kristin O’Neill, Maddie Mills, and Amy Curlew definitely stood out, especially as the Big Red pushed to tie things up in the third period. But they’ve had one of the most consistent and reliable top-nine forward groups in the country all season. All three of those lines have been counted on to provide offense when needed, and having that strong depth really helped them match up against the Gophers’ offense. This was Cornell’s first Frozen Four appearance since 2013, and in a lot of ways it was hard-won. Cornell missed out on the NCAA Tournament last year, despite having a more than capable team; they were just above the cut in the PairWise, in seventh place, and were knocked out by some lower-ranked teams who won automatic bids into the tournament. This year, though, the Big Red were one of the country’s steadiest teams. Derraugh said in the postgame press conference that understanding the importance of every game of the season, and how they each can help or hurt the team’s chances at making the field, helped keep the Big Red more balanced and even-keeled.